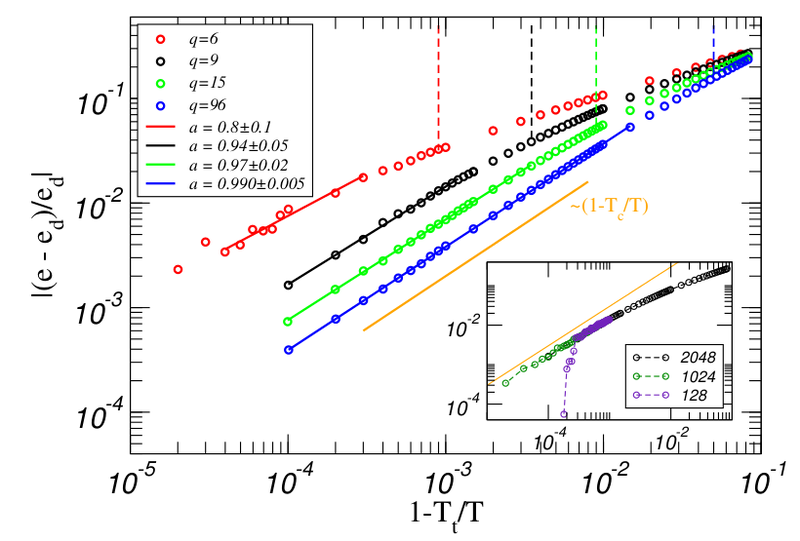 Pseudo-equilibrium (a) and time-dependent (b) single-particle density of states for a system size , as function of temperature and time respectively. Data in (b) corresponds to . 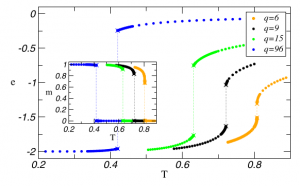 (a) Inset: time evolution of the polarization starting from a random initial configuration at different temperatures for . 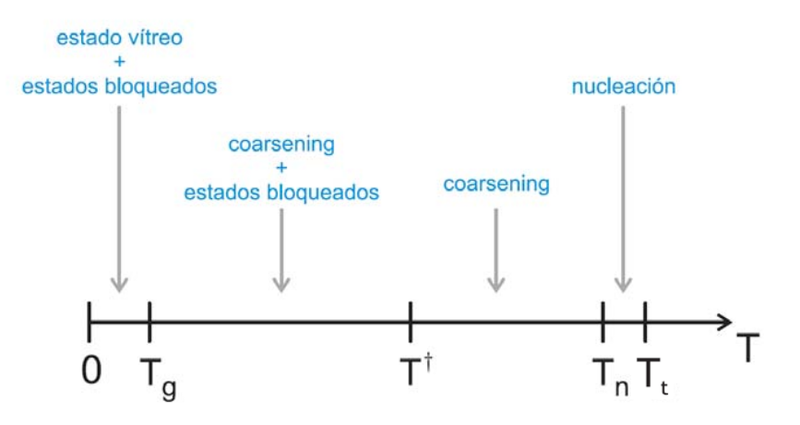 The steady-state conductivity is reached after a transient time . Main figure: same data rescaled as a function of . (b) Fit to the Efros-Shklovskii law for . Computing time [ms] per executed hop for the serial and parallel codes in three different CPU+GPU platforms. We benchmark a fair serial single CPU core implementation against our parallel GPU implementation (with the same CPU core as host), both with double precision floating point operations. (a) Temperature dependence of the average rejection time for . 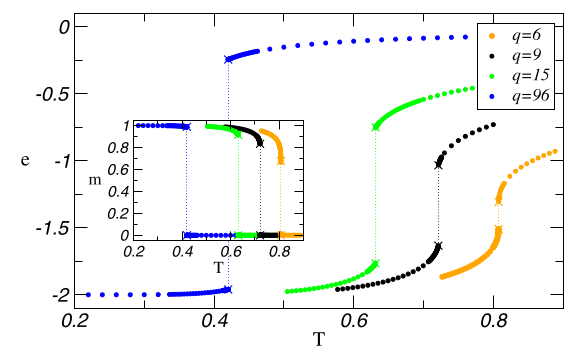 (b) Size dependence of the average update time of the local energies. The insets show the speedup of the GPU over the CPU implementation. While the speedup starts to saturate with L in (b), it is still strongly growing with in (a). 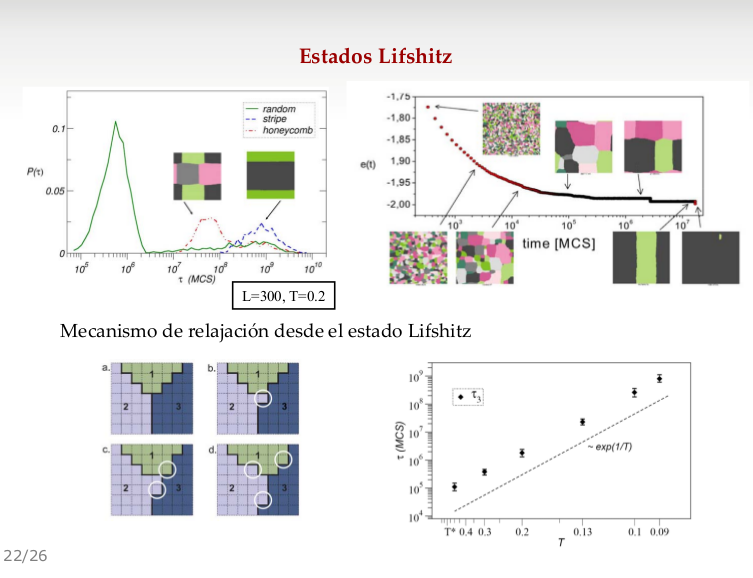 We develop a parallel rejection algorithm to tackle the problem of low acceptance in Monte Carlo methods, and apply it to the simulation of the hopping conduction in Coulomb glasses using Graphics Processing Units, for which we also parallelize the update of local energies. In two dimensions, our parallel code achieves speedups of up to two orders of magnitude in computing time over an equivalent serial code. 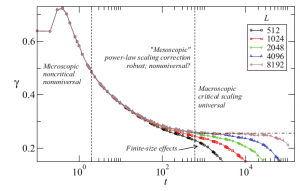 We find numerical evidence of a scaling relation for the relaxation of the conductivity at different temperatures. Linking transport and geometry. 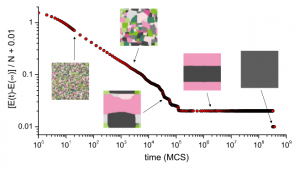 (a) Snapshot of a domain wall in a two-dimensional ferromagnet. (b) Typical velocity–force characteristics. (c) Crossover lengths l_opt and l_av representing the optimal excitation and the deterministic avalanches, respectively. (d) Geometric crossover diagram. 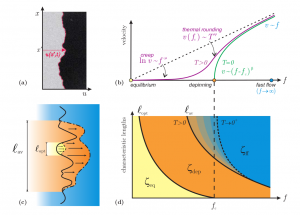 Low temperature dynamics of the driven elastic string below the depinning threshold. 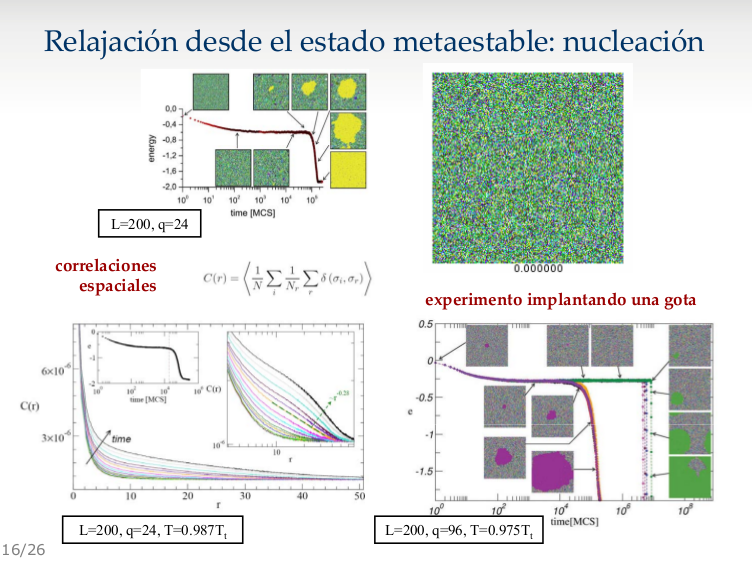 We present the main concepts behind the statistical and dynamical properties of elastic systems in disordered media, focused on the relation between the rough geometry and collective transport properties in driven steady-states. 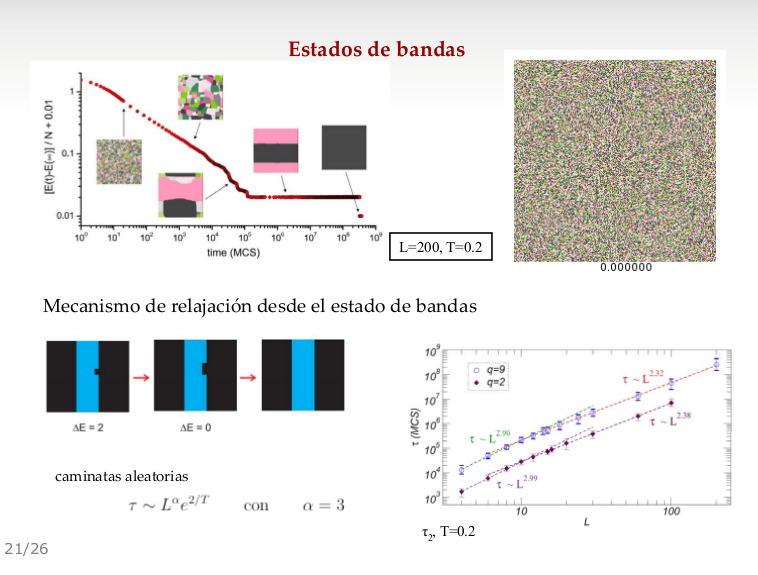 We review the numerical approaches that allow to analyze the equilibrium, creep, and depinning regimes of motion in these models. The function showing finite size effects in the QEW line relaxation. 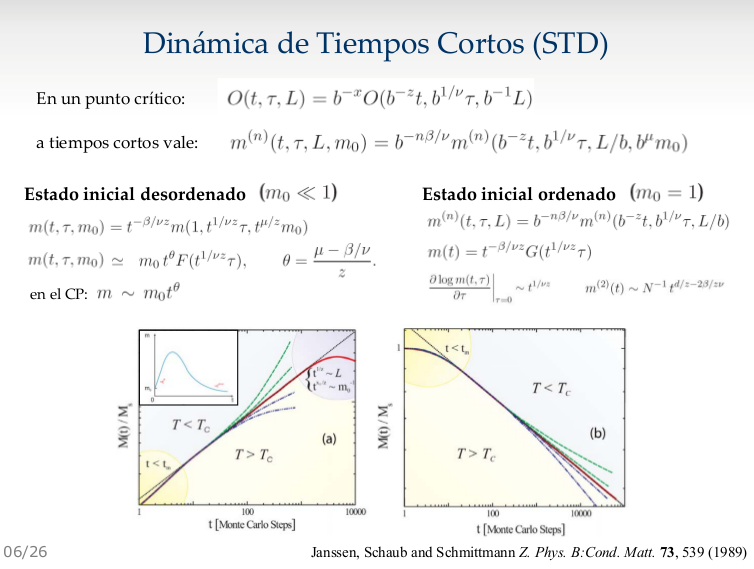 String velocity v(t) as a function of time, and rescaling with the critical exponents . 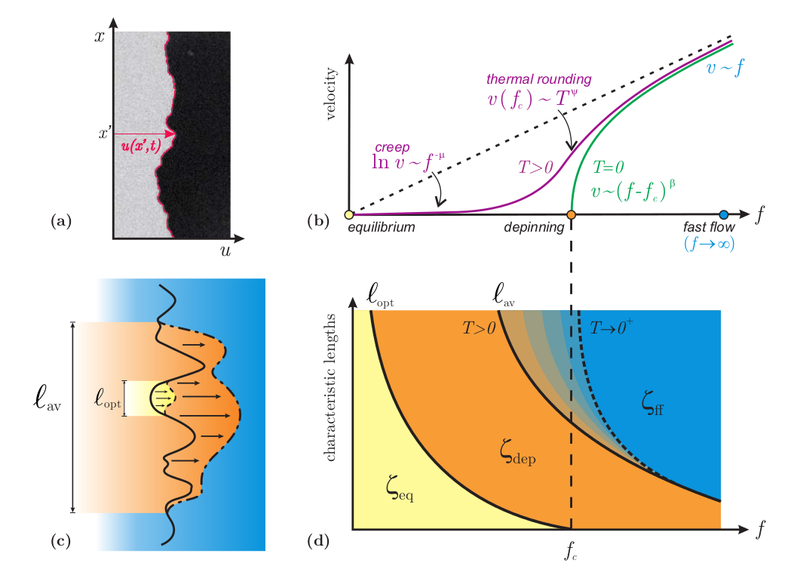 We study the nonsteady relaxation of a driven one-dimensional elastic interface at the depinning transition by extensive numerical simulations concurrently implemented on graphics processing units. 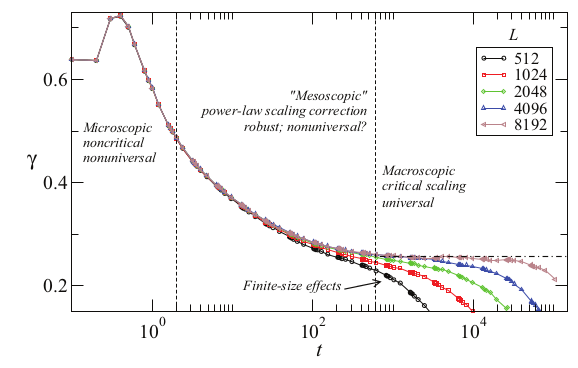 Above a first, nonuniversal microscopic time regime, we find a nontrivial long crossover towards the nonsteady macroscopic critical regime. 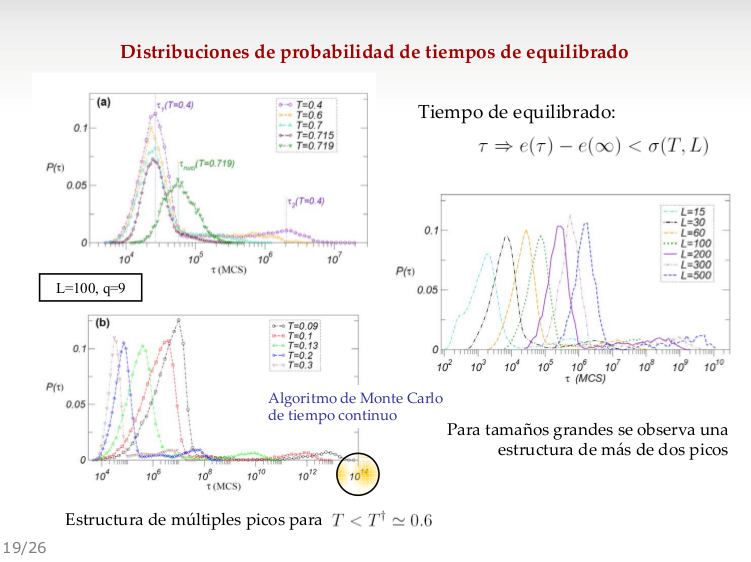 In order to avoid fitting effective exponents with a systematic bias we implement a practical criterion of consistency and perform large-scale ( ) simulations for the nonsteady dynamics of the continuum displacement quenched Edwards-Wilkinson equation, getting accurate and consistent depinning exponents for this class: , , , and . 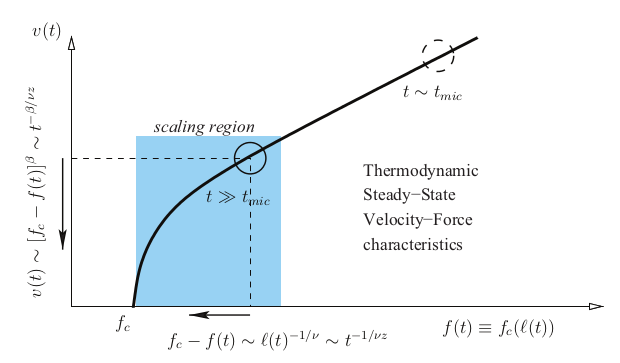 Schematic behavior for the internal energy as a function of the temperature at the -state Potts model first order phase transition. 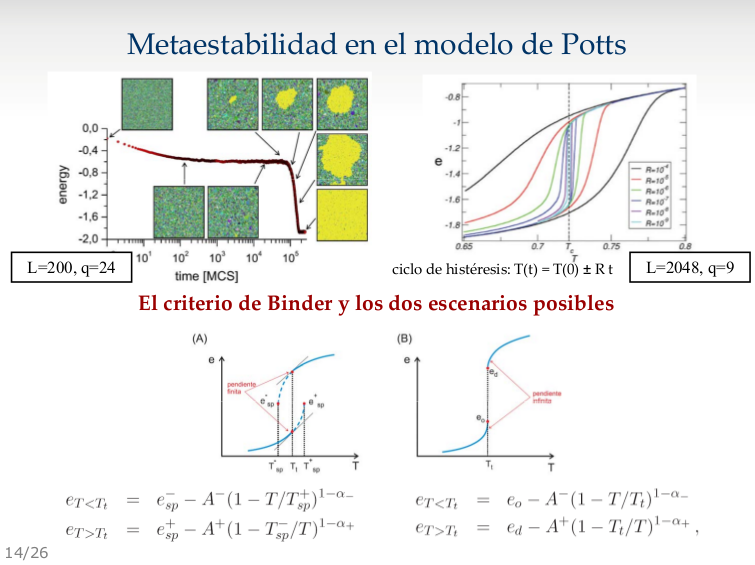 The two scenarios proposed by Binder. 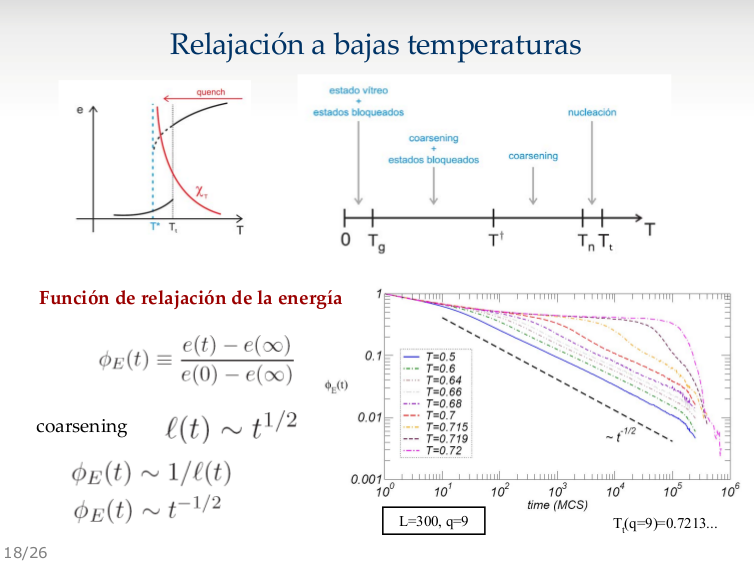 Energy and magnetization as a function of temperature for different values of . 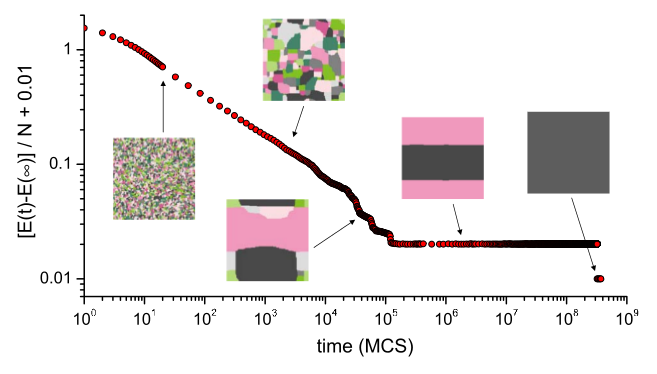 We implemented a GPU-based parallel code to perform Monte Carlo simulations of the two-dimensional -state Potts model. 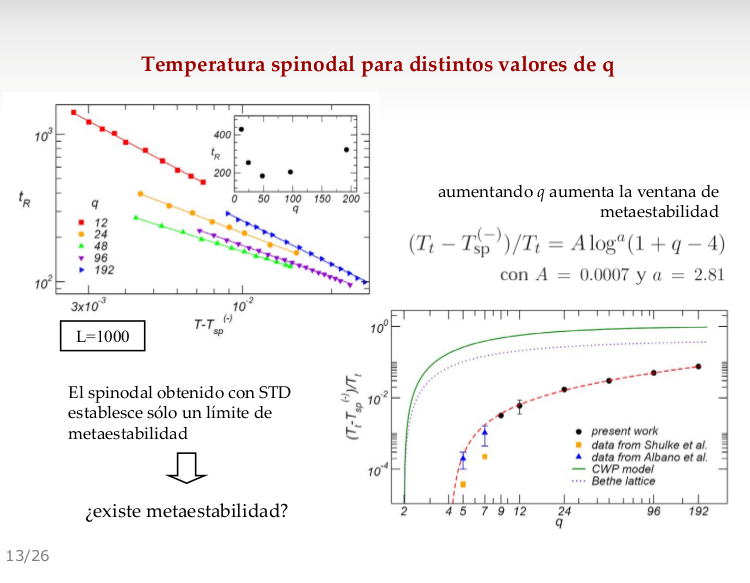 The possibility of performing high speed simulations at large enough system sizes allowed us to tackle an old standing question posed by k. Binder in 1981, regarding the existence or not of specific heat singularities at spinodal temperatures different of the transition one. 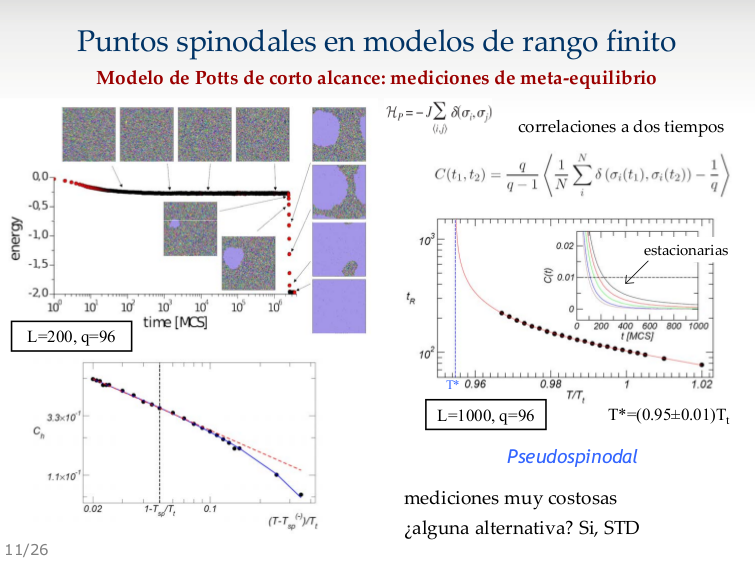 Also find here our approach to the spinodal points in the -state Potts model. 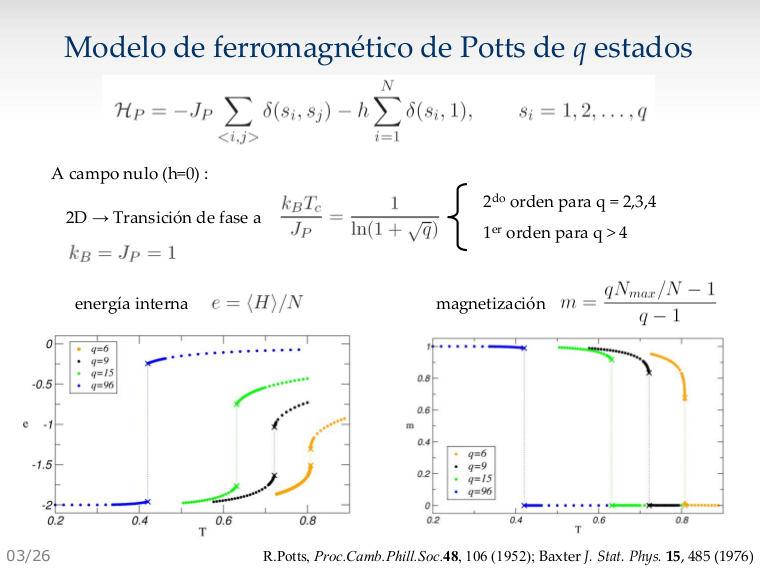 We studied the nonequilibrium dynamics of the -state Potts model in the square lattice, after a quench to subcritical temperatures. 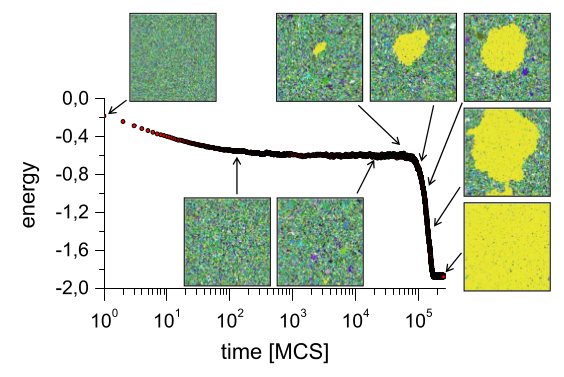 By means of a continuous time Monte Carlo algorithm ͑nonconserved order parameter dynamics͒ we analyzed the long term behavior of the energy and relaxation time for a wide range of quench temperatures and system sizes. 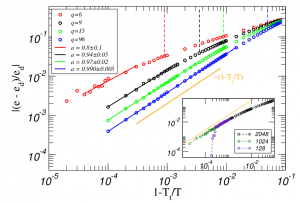 For we found the existence of different dynamical regimes, according to quench temperature range. 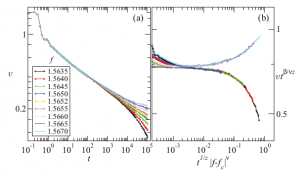 Dynamical regimes in the long term relaxation of the -state Potts model with , after a quench from infinite temperatures down to a subcritical temperature T.
Blocked states. 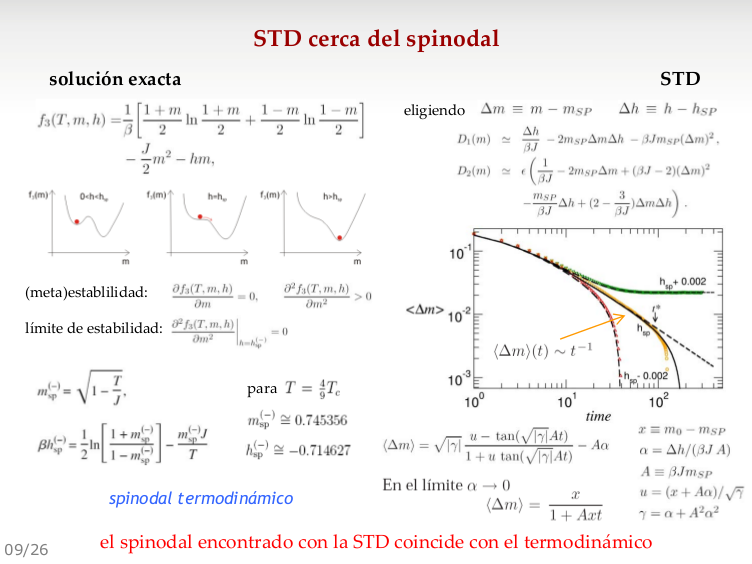 Energy per spin as a function of time and typical spin configurations in one realization of the stochastic noise, when the system gets stuck in a striped configuration. Glassy state. 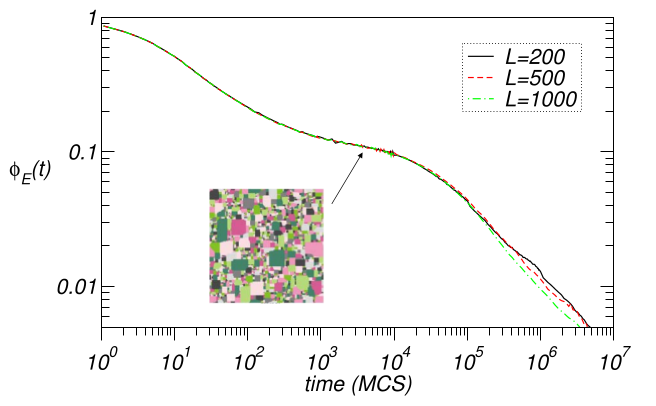 Relaxation function for , , and different values of L. The inset shows a typical configuration of the glassy state associated with the plateau. 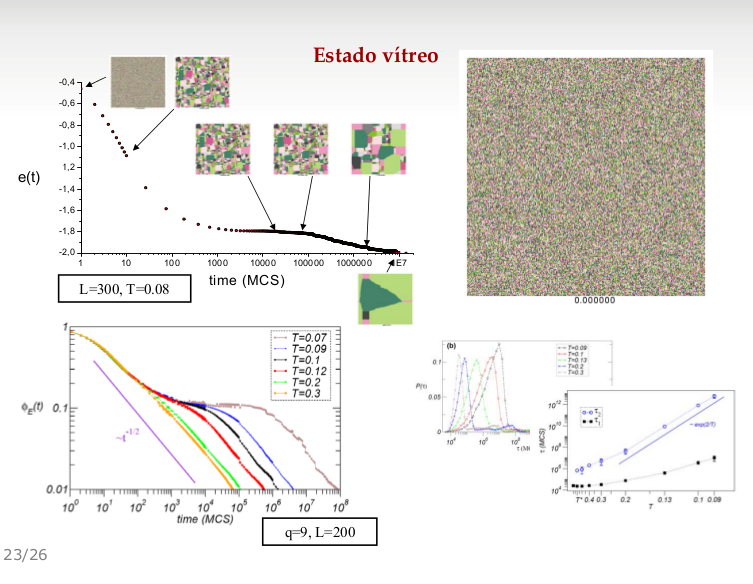 View full article…and find here some related videos related to my PhD thesis.